AP EAMCET Syllabus 2019: Jawaharlal Nehru Technological University (JNTU), Kakinda will organize AP EAMCT for all the candidates who want to pursue their career in the fields of engineering, agriculture and medical in the month of April. Andhra Pradesh Engineering, Agricultural and Medical Common Entrance Test (AP EAMCET) is a state level entrance exam providing admission into various engineering & medical colleges in AP state. 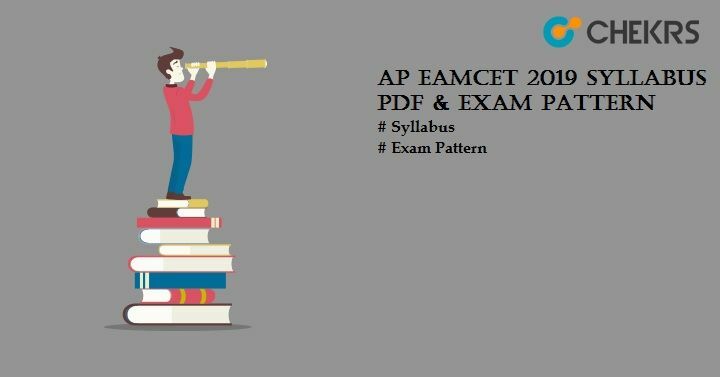 Latest Update:AP EAMCET Syllabus 2019 Pdf Link Updated. Check the links below. Candidates must follow the syllabus prescribed by the official authority of JNTU to obtain good marks or maximum marks. AP EAMCET Syllabus covers the entire chapters from class 11 & 12 subjects. Syllabus will be different for engineering, agriculture & medical students. Candidates applying for engineering courses will have to follow the AP EAMCET Engineering Syllabus. In this article we are providing all the details related to exam syllabus and exam pattern. Candidates are advised to read the article and perform well in exam. Here we are providing the detailed AP EAMCET Syllabus Pdf for engineering & Medical courses. Ray optics and Optical Instruments, Wave Optics, Electric Charges and Fields, Electrostatic Potential and Capacitance, Current Electricity, Moving Charges and Magnetism, Magnetism and Matter, Electromagnetic Induction, Alternating Current, Electromagnetic Waves, Dual Nature and Radiation of Radiation and Matter, Atoms. Chemistry Atomic Structure, Chemical Bonding and Molecular Structure, States of Matter: Gases and Liquids, Stoichiometry, Thermodynamics, Classification of Elements and Periodicity in Properties, Chemical Equilibrium and Acids-Bases, Hydrogen & its Compounds, The S-Block Elements, P- Block Elements Group 13 (boron family), P-Block Elements Group 14 (carbon family), Environmental Chemistry, Organic Chemistry – Some Basic Principles and Techniques, Solid State, Solutions, Surface Chemistry, P- Block Elements, D and F Block Elements. Zoology Diversity in the Living World, Animal Diversity- I, Animal Diversity-II, Locomotion & Reproduction in Protozoa, Structural Organization in Animals, Biology & Human Welfare, Structural Organization in Plants- Morphology, Type Study of Periplaneta Americana, Ecology & Environment, Human Anatomy and Physiology-III, Human Anatomy and Physiology-II, Human Anatomy and Physiology-IV, Applied Biology, Organic Evolution, Genetics, Human Reproduction. The AP EAMCET 2019 Exam Pattern will be decided by JNTU, Kakinda. Exam pattern gives an idea about the examination. The examination pattern provides details about the exam, such as difficulty level of question paper, mode of examination, exam language, time duration, total marks, etc. Candidates present for the examination should examine the examination pattern set by the exam conducting authority of JNTU. Exam Pattern will be decided according to the streams. It will be different for courses like engineering, agriculture & medical. Check the mentioned Andhra Pradesh EAMCET Exam Pattern for Engineering and Agriculture & Medical. Examination will be held in online mode only. Exam will be conducted in 2 shifts i.e. Morning Shift & Evening Shift. Paper will be asked in English, Telugu & Urdu languages.